Authors developed a global database of over 1900 Indigenous communities and estimated seafood consumption at 2.1 million metric tonnes per year or 2% of global catch. Coastal Indigenous people consume 74 kg of seafood per capita, whereas the global average is 19 kg. Within country populations, Indigenous consumption was on average 15 times more than non-Indigenous. Coastal Indigenous people eat, on average, 15 times more seafood per person than non-Indigenous people in the same country, finds a Nippon Foundation-Nereus Program study published today in PLOS ONE. This highlights the need to consider food sovereignty and cultural identity as part of fisheries policy and Indigenous human rights. 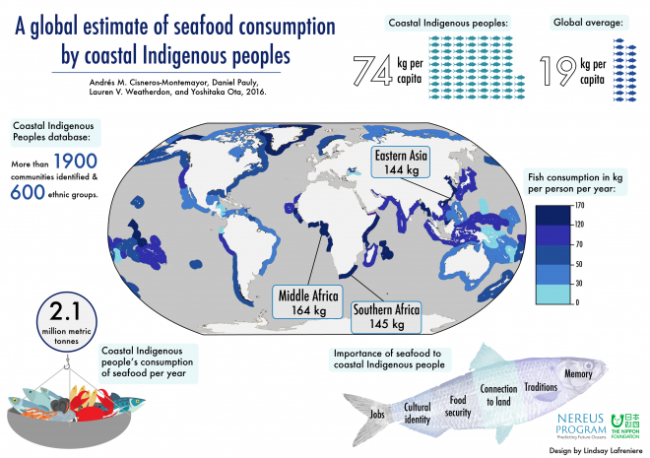 The first global-scale analysis of its kind, the authors estimate that coastal Indigenous people consume 74 kg of seafood per capita, whereas the global average is 19 kg. The communities studied include recognized Indigenous groups, self-identified minority groups, and Small Island Developing States. These groups all share similar histories of marginalization and deep social and cultural connections to marine environments. 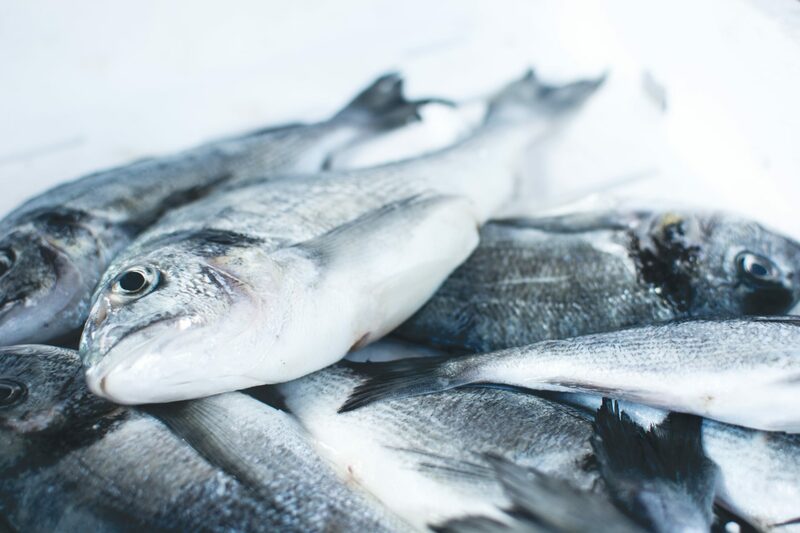 The authors collected observed data and worked with local researchers to build a database of more than 1900 communities who altogether consume 2.1 million metric tonnes of seafood per year. 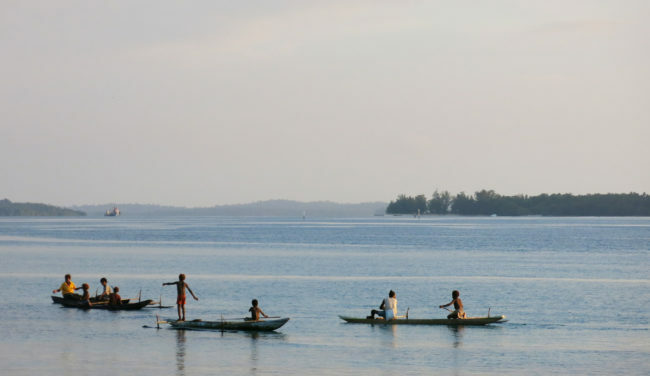 Mothers and children handlining for fish in the evening in Kavieng, Papua New Guinea. Image by Colette Wabnitz. The ocean provides a vital source of food and economic security for these communities, while also shaping their cultural heritage and spiritual values for millennia. The study’s estimates are the base requirements for seafood, as only consumption was included and not employment and economic needs. Due to this reliance on ocean resources, climate and ecosystem changes are increasing the vulnerability of coastal Indigenous peoples. The authors urge that not only must fish and ecosystems be protected, but also those lives and culture that depend on the ocean. The study “A global estimate of seafood consumption by coastal Indigenous peoples” was published in PLOS ONE, additional authors include Daniel Pauly, chair of the Nereus Steering Committee, and Lauren Weatherdon, Nereus collaborator. Article link: http://dx.plos.org/10.1371/journal.pone.0166681.